Thomas Hooten is Principal Trumpet of the Los Angeles Philhar­monic Orchestra. 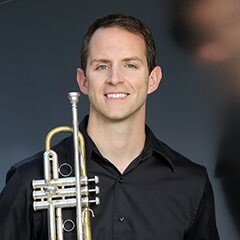 Prior to joining the Los Angeles Philharmonic, Hooten served as Principal Trumpet in the Atlanta Symphony from 2006-2012. He released Trumpet Call, his first solo album, in 2011. Hooten began his career in 2000 with a trumpet/cornet position in “The President’s Own” United States Marine Band in Washington, D.C., where he was often a featured soloist. While with the Marine Band, Hooten won the 2nd trumpet audition with the Richmond (VA) Symphony, where he continued to perform through 2004. He went on to join the Indianapolis Symphony as Assistant Principal Trumpet for two years, before his position in Atlanta. Hooten has served on the faculty for The Aspen Music Festival, and while in Atlanta, he shared a studio with his wife, Jennifer Marotta, at Kennesaw State University. A native of Tampa, Florida, he earned his Bachelor of Music degree from the University of South Florida and his Master of Music degree from Rice University. His primary trumpet teachers have included Armando Ghitalla, John Hagstrom, and Don Owen.